Railway networks in the Southern part of the BSR (Germany, Poland) are, for historical reasons, quite dense offering various direct interconnections between major and regional cities. In the North, density of railways decreases, offering only passenger trains between major cities. In Sweden, Finland and Norway, however, rail infrastructure still plays a prominent role for long-distant freight transport. 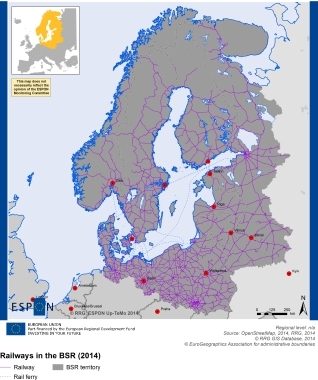 Railway networks in the Baltic States are poor, with only few passenger connections. Direct trains connecting Tallinn, Riga and Vilnius with each other are not available in sufficient user-friendly quality (lack of connections, low frequencies, long travelling times with interchanges etc.). Since there are only few rail ferries crossing the Baltic Sea, the Baltic Sea still is a barrier for direct north-south or east-west rail transport.